Need your make-up brushes to be portable? Want all your essential brushes all in one handy set? Then look no further than the Real Techniques collection sets. Designed for the make-up wearer on the go, most sets come in handy cases, easily transportable and conveniently small enough to take up minimal space in that weekend bag! 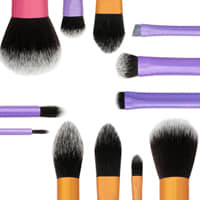 Value for money and all the essential make-up brushes you could need in one place. What more could you want?